The PackMaster Compactor features welded steel construction and quality components providing the perfect combination of operator safety and control. 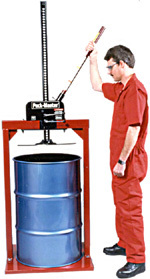 With the Pack-Master you can effortlessly compact material in a 30 or 55 gallon drum reducing the cost of disposal by 80%. 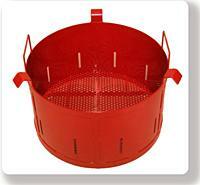 Plus, the optional sorbent basket (Model N-1463 (Pic. 6) reclaims the waste fluids that were previously thrown away. 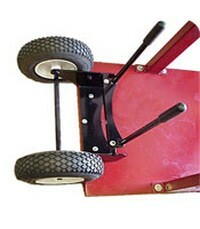 Save time and money with the available wheel kit (Model N-1260 Pic. 5) that allows you to take the Pack-Master anywhere. 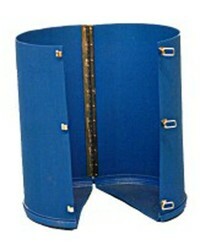 Increases Recycling Revenue - Reduce your disposal and storage costs. Portable - Add optional wheel kit (Model N-1260 Pi. 5) to easily move the Pack-Master from department to department. 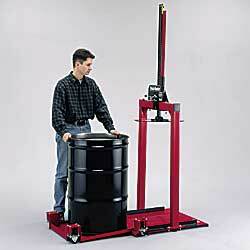 Simple Mechanical Operation - No dangerous high pressure air, hydraulic cylinders or electric motors. POWERFUL. These units can deliver a whopping 4000 pounds of force giving a compaction ratio of up to 4 to 1.